Add phonetic modifications or a new voice tag to the phone's contact name so that it is easier for HFL to recognize voice commands. Select the Voice Recog tab. Select the phone you want to add phonetic modification to. Select a contact name you want to add to. 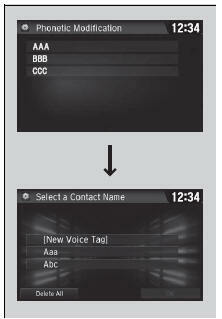 Using Record or the button, follow the prompts to complete the voice tag. You will receive a confirmation message on the screen, then select OK. 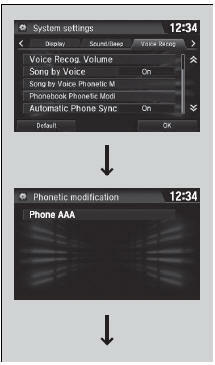 Select the phone you want to modify phonetic modification. Select a contact name you want to modify. Select the phone you want to delete phonetic modification. Select a contact name you want to delete. The selected contact name has been selected. The contact name list appears. You will receive a confirmation message on the screen, then select Yes.